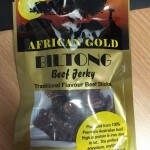 This review is of a 50 gram pack of the African Gold Biltong Beef Jerky Traditional Flavour Beef Sticks. 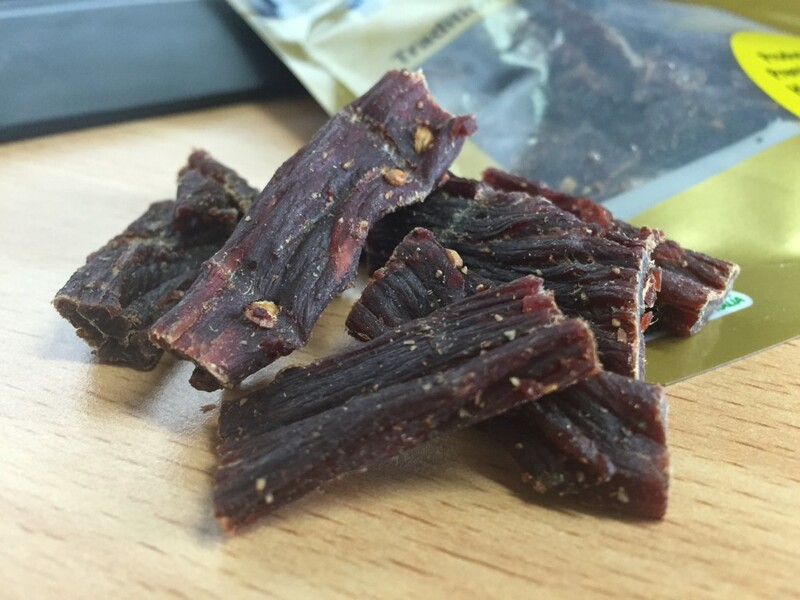 I’ll just refer to the product as jerky rather than biltong as it is quite dry and is presented as small bite sized pieces as shown above. 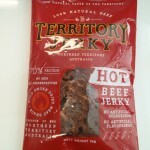 As mentioned earlier, the jerky is cut into small bite sized pieces with pepper and nutmeg clearly visible. The pieces look quite soft and chewy, but are actually rather hard to chew at first. I found it hard to bite into or rip a strip of meat off the side of a piece, instead it was best just throwing a whole piece in your mouth and start chewing like crazy into the piece starts to break up and soften. The flavour of this jerky doesn’t really appear until you have really broken it down in your mouth. There isn’t really any outer/surface seasonings apart from the small amounts of pepper and nutmeg, so get chewing to get a taste of the simple yet pleasing flavour. The overall flavour is quite nice and simple – nothing outstanding but then again it is branded as an original flavour. As the meat is rather thick, the first few bites are quite hard, but the small pieces eventually break up after a fair bit of chewing. Each piece was of similar thickness and of good quality with no evidence of fat. The meat has the cured/preservative style to it, which makes it look soft, however is quite hard. At $4.95 for 50g as stated on their website, this represents good value for this type of mass produced jerky. 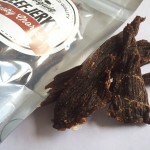 Most people have probably seen this jerky for sale at convenience stores, local butchers or green grocers. It’s long shelf life due to added preservatives makes it perfect for these types of businesses. If you like your more mass produced jerky in standard flavours then this product is good value and is easy to stomach.